Ramena is a charming, steadily growing fishing village located in Diego Suarez Bay, 18 kilometres north of Diego Suarez. The village is situated directly at the several kilometres long Ramena Beach. Various hotels and local restaurants are dotted along the beach. Ramena is a popular destination for holidaymakers and day-trippers from Diego Suarez. A local taxi-brousse costs about 2,000 Ariary per person one way, a private taxi charges between 35,000 and 40,000 Ariary for a round-trip. The street from Diego Suarez to Ramena snakes along the curve of the bay, offering beautiful views onto the bay and Nosy Lonja (Sugarloaf Island). Throughout the week Ramena is a quite village. Except the street to the pier, there are no paved roads and consequently not many cars in the village. Locals are either living from fishing or tourism. Throughout the weekends, Ramena converts into a party-strip. 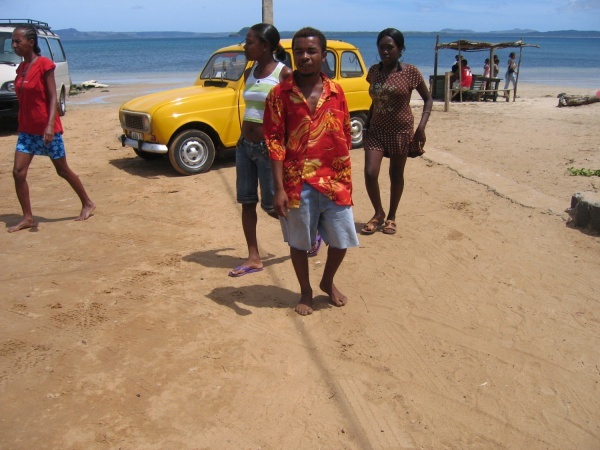 City-dwellers from Diego Suarez flock on their free day to the beach for a day-long party, usually returning in the evening. The tarred road behind the village leads to the military zone ORANGEA where soldiers will charge a 5,000 permit fee per person for passing the gate (far less for locals). The ruins of former military buildings and huge canons pointing over the water can be seen at this location. On the way to ORANGEA one passes the former holiday house of the ex-president Marc Ravalomanana. About three kilometres from Ramena is Cap Miné Lighthouse, from which one can see the passage to Diego Suarez Bay. From there it is only a short walk to Baie des Dunes and Baie des Pigeons. A trip to Emerald Sea can easily be arranged by any of the hotels in Ramena. Alternatively, local fishermen are willing to take tourists to the turquoise waters at a lower price. The dive-centre MadaScaph takes divers to various dive spots in the bay. Villa Palm Beach is a small and authentic Malagasy style accommodation, close to the beach. La Case en Falafy is most popular amongst tourist. The hotel has a swimming pool and a large restaurant with a view over the ocean as well as a kitesurfing school. Two-storeyed restaurant located directly at the beach.